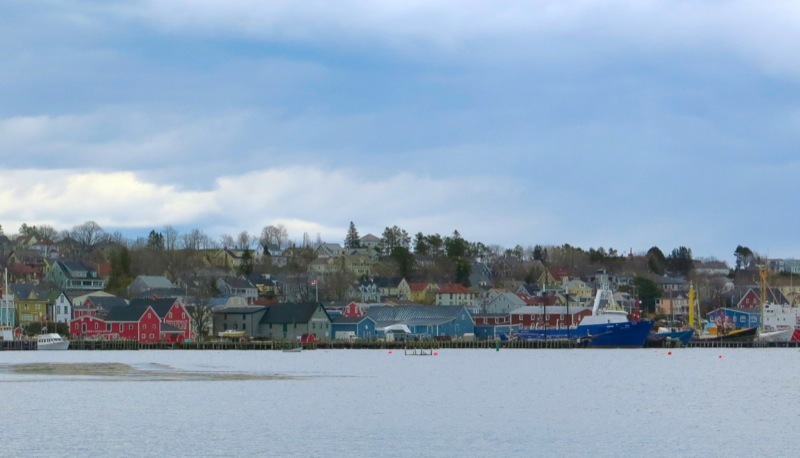 I was delighted when Shelah Allen from Lunenburg Tours arranged a 2 hour Lunenburg walk to include culinary Lunenburg items for Vanja and I, as we were arriving during the shoulder season, when everything is closed. 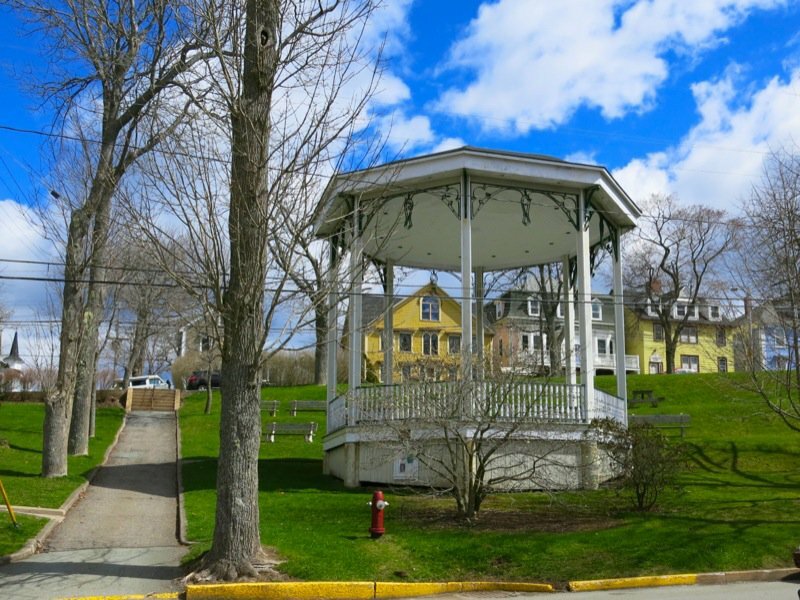 Ashlee Feener greeted us at the Lunenburg Academy and walked us through the town and through the history of this jewel box of a town telling stories and the past rose before our very eyes through the streets. Ashlee’s story telling manner was compelling! I could listen to her all day. 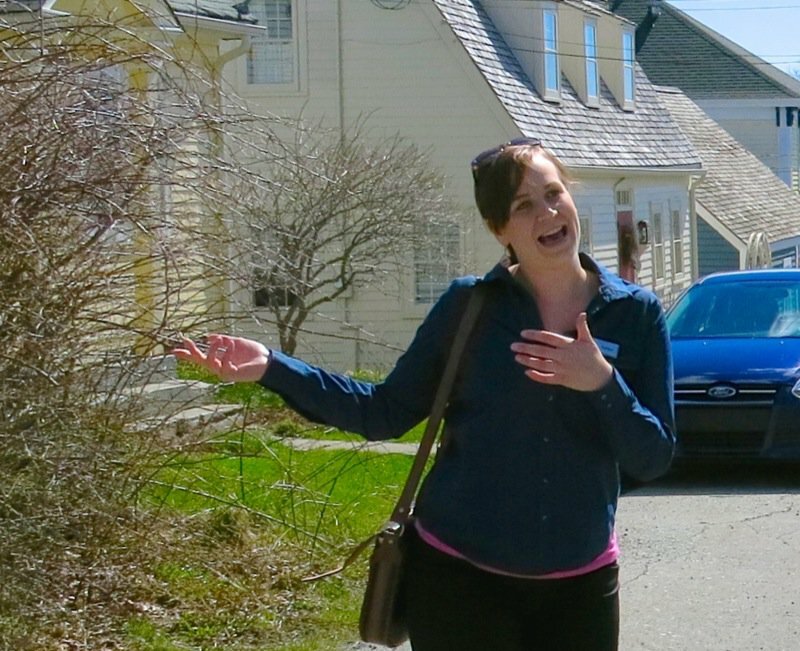 Ashlee calls this house “The Wedding Cake House” and you can see how exuberant she is, above, talking about it. I thought it was “her” name for the house, but apparently, it is known “officially” as “The Wedding Cake House”. She pointed out that though it was a bit of a walk from the harbour, that the window on the roof was built to protrude, so the woman of the house could always have an eye to the sea, and often sat in the window, watching for her man to come home. Ashlee brought that story to life. In the early days, many men were lost at sea, so this became known as the “Widow’s Watch”. I think I even saw the curtains move when she spoke. 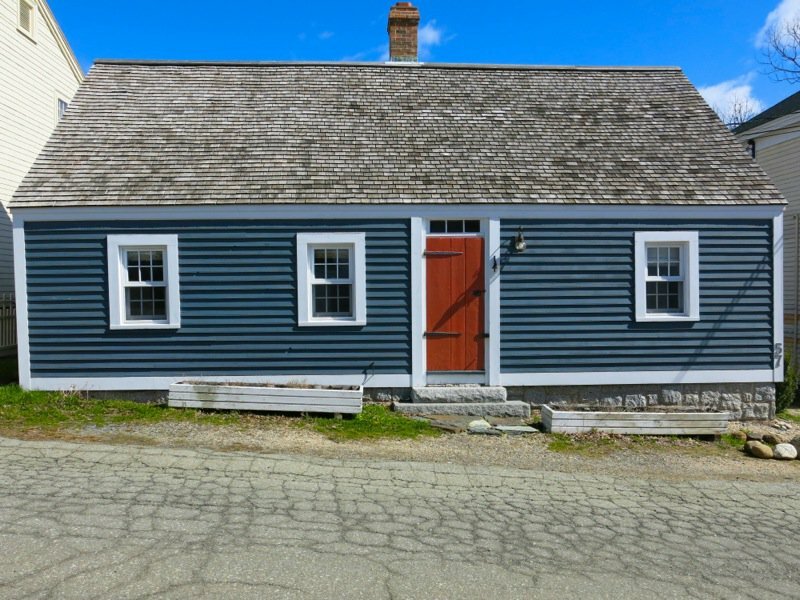 Ashlee and Shelah believe this is the oldest home in Lunenburg, though another has begun to claim the same, they stand firm on their research. 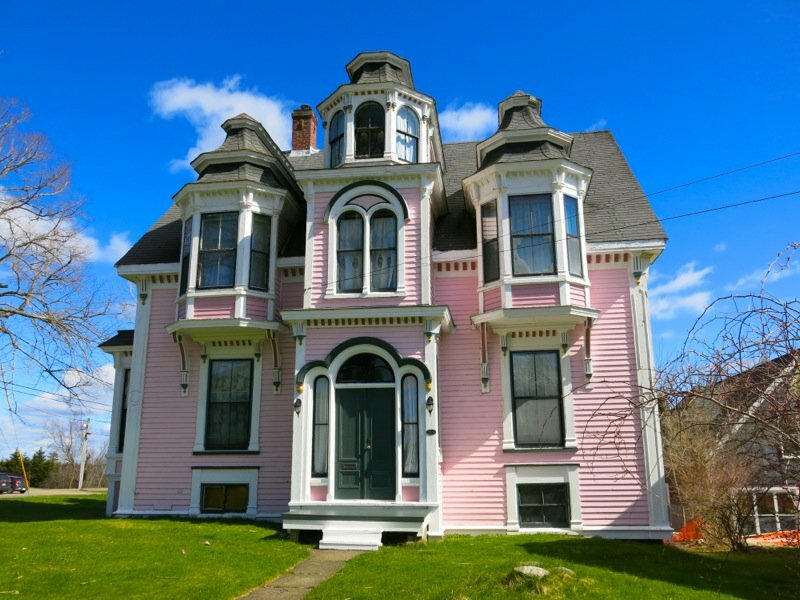 This home is nothing like most in the town, yet charming, no? 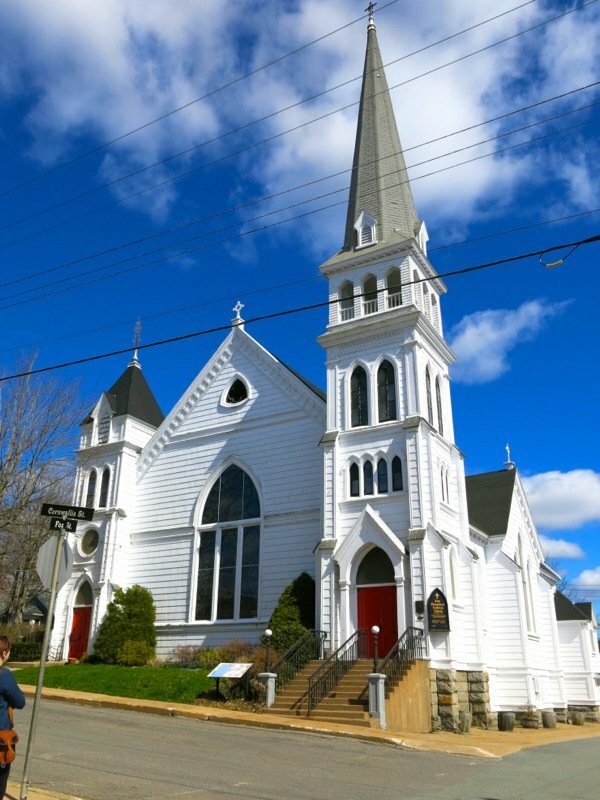 One of the four large white churches in this small town. 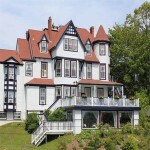 The Boscawen Inn was recommended by Shelah. 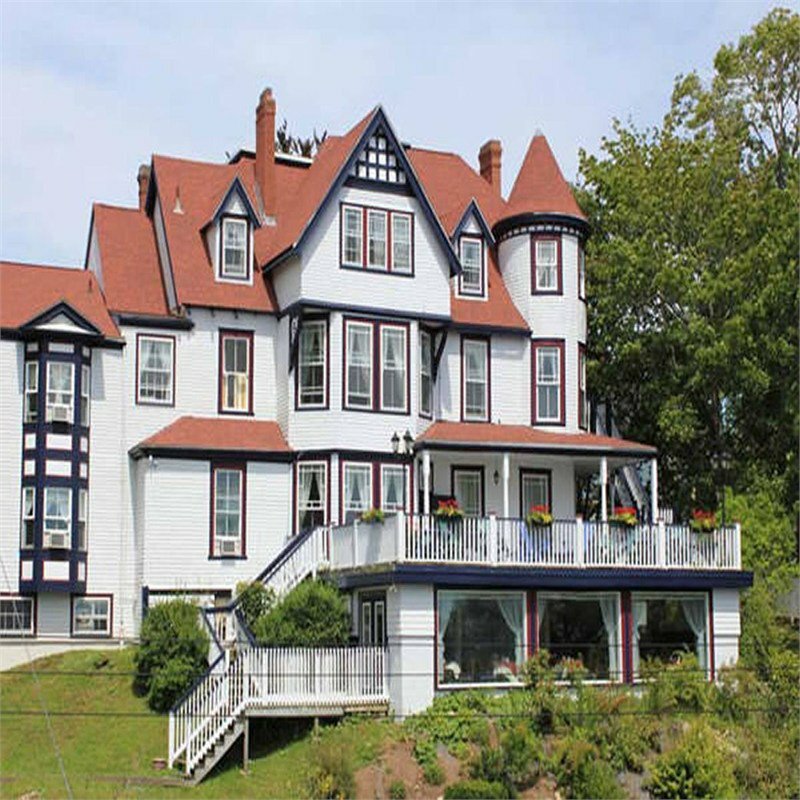 I had other recommendations, so it was not an easy decision to make from afar, as there are so many beautiful Bed and Breakfasts in the area. However, I decided to do the full Shelah and Ashlee package, and this Inn, or mansion ?, was divine. More to come on that, later. No one holds back here. Colour and charm works wonders as on the greyest of days, gayety abounds. 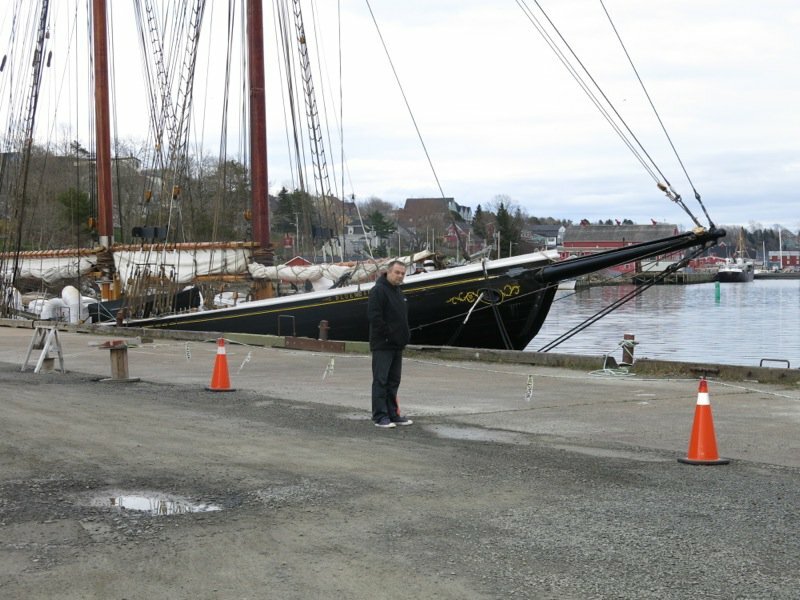 Above, you can see the “Widow’s Watch”, but The Lunenburg Bump you will see below. Winters were so cold and the wind so savage on the ocean, that homes had a vestibule or a porch built onto the front for people to step into, close the door behind them, shed their outer ware, and then open the inner door to the warmth of the home. This particular look with the top “widow window” are very common in the town, and specific only to this area. 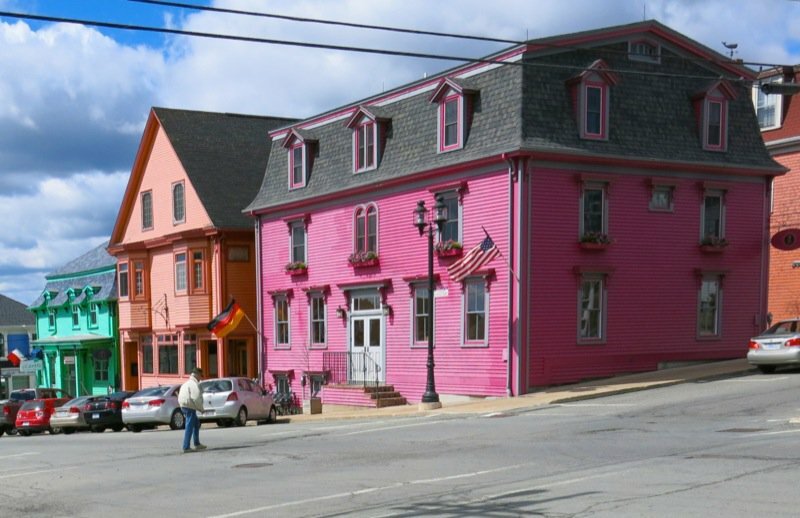 Typical elements of building tradition particular to Lunenburg include sturdy wooden construction, clapboard or shingle cladding and wooden trim elements. 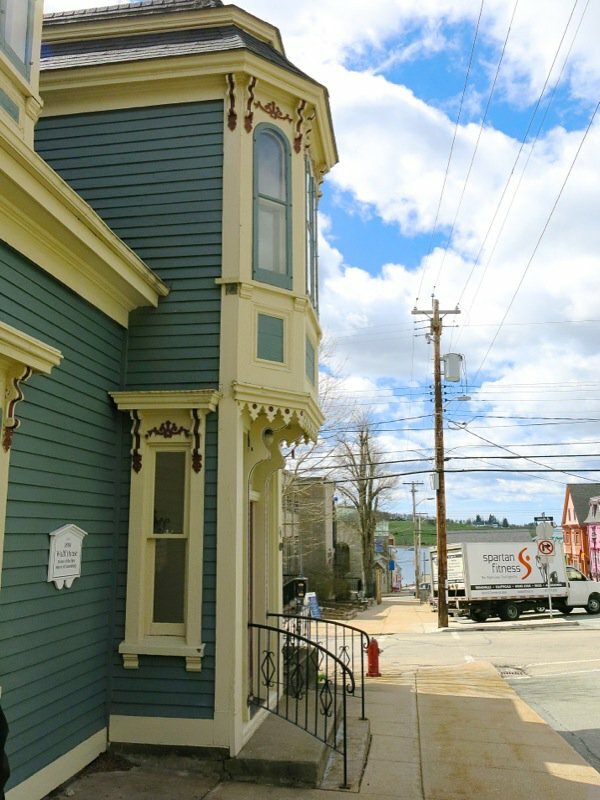 “The most noticeable vernacular building element in Lunenburg is the “Lunenburg Bump:” an enlarged dormer extended out over the eaves, either five-sided or rectangular. 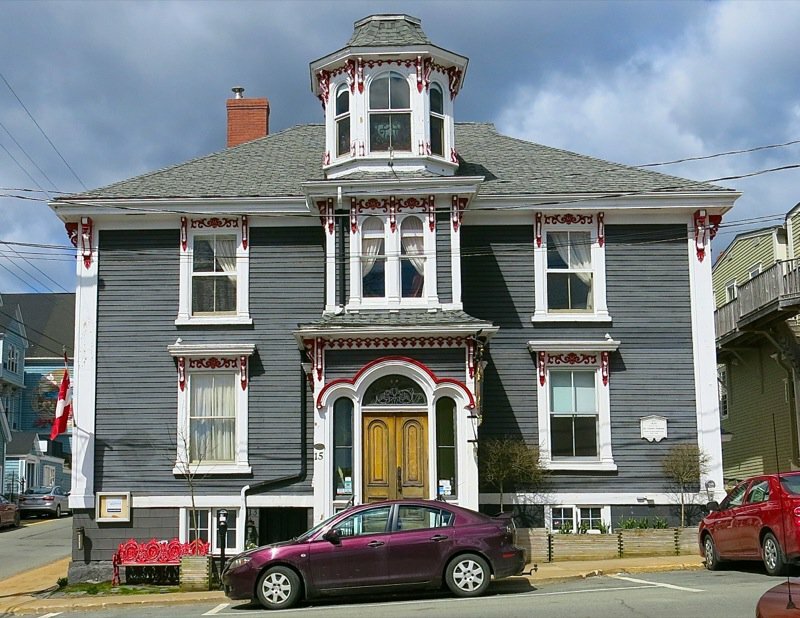 Most are situated in the centre of the front façade over the entrance, which may be in an attached storm porch.” According to Shelah, these structures are not unique to Lunenburg, but were created here. 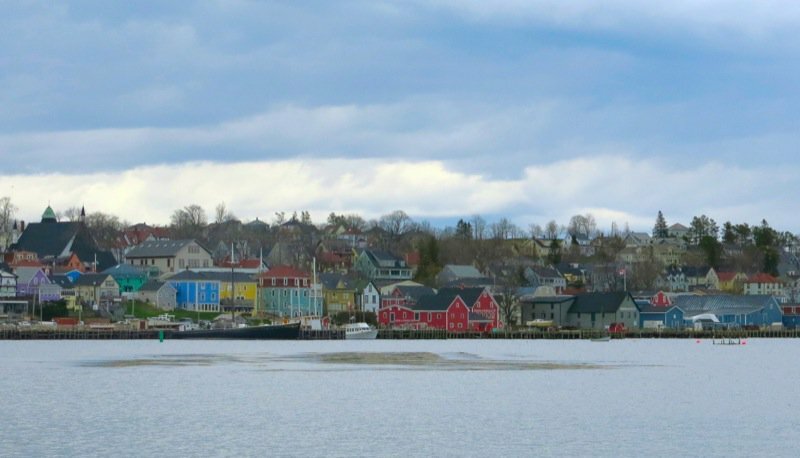 Shelah actually joined us in time to relay that at settlement there was no one of Austrian descent in Lunenburg; German, Swiss and a few Huguenot French were the first settlers. And just before this, at this house, Ashlee pulled this little surprise out of her bag. Her grandmother’s heritage Lunenburg cookbook. Eurika! The recipe for Lunenburg Pudding is definitely in this book! She did tell me there were new editions that were now typed, but the recipes were the same. I was definitely going to ask her were I could get it, but forgot. However, on my travels later that day, I asked a shop owner. “At the Hospital Gift Shop.” The hospital gift shop? Really? Of course, I didn’t question her, but found my way there and bought my own copy – one of the few left with the hand printing, as above, and wagged my little tail back to my car. 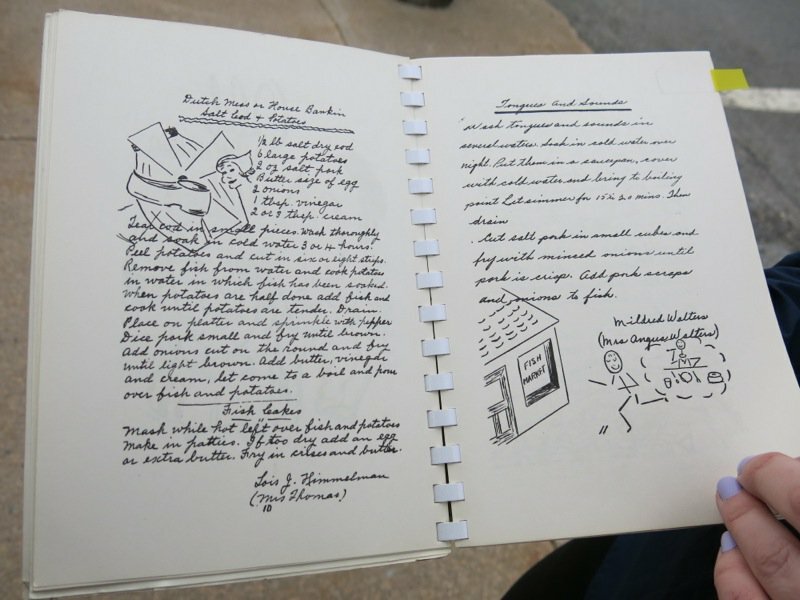 Apparently this cookbook began as a fundraising project by the Ladies Auxiliary for the Fisherman”s Memorial Hospital and was first published in 1953 and has remained such ever since. Of course, that is barely a heritage cookbook to me! There was much more to the tour, but onto the food. 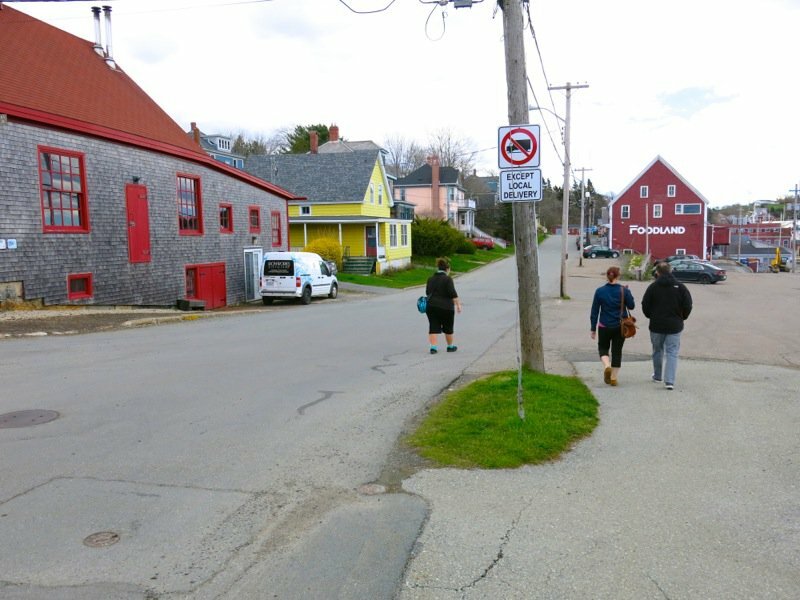 Above, we trek to Foodland, and to the left across the street, the red and grey building is Ironworks Distillery. That post will follow. My head spins thinking of that tasting. Please meet the lovely Mr. Dave Robb. He greeted us with passion for his Lunenburg Pudding, “You are going to have a taste experience today that you have never experienced and never will, except for right here!” I had tasted Lunenburg Pudding the year before at our Slow Food in Canada National Conference in Osooyos as it had just become a Slow Food in Canada Ark of Taste Food. But, I found Dave was right. 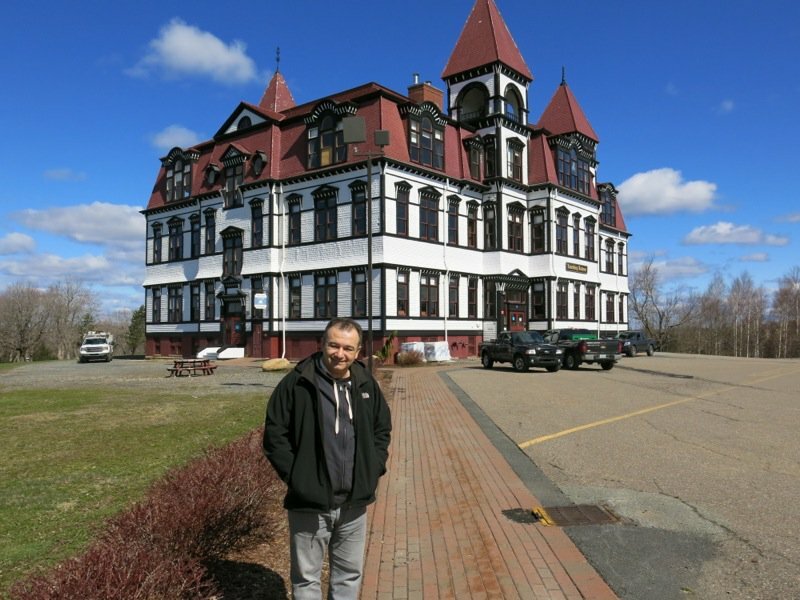 His Lunenburg Pudding is delicious and he is rightly proud of this product as the recipe came from an old Foodland meat manager’s grandfather and has been made in Lunenburg for years; the recipe a guarded secret. It is now made on site with “only the best local ingredients: beef, pork, pepper, Summer Savoury, corriander and onions.” What a testament to the power of heritage food and sense of community. 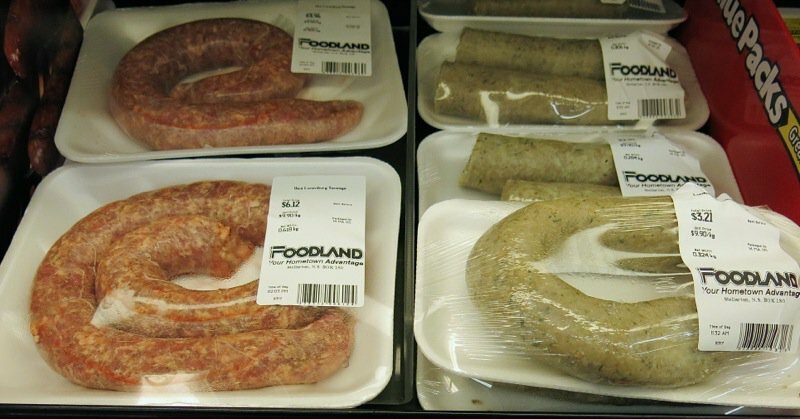 The idea was pitched to the owners of Foodland to make this and the sausage on site to sell at this store location, only, and the town is now provided with this excellent local heritage product. “In the old days, everyone in the area used to make the pudding [each had their own similar and “best” version] hang it in their attic, and cut off pieces throughout the Winter. I’ll tell you everything that’s in it, but not the portions. Those are my secret!” The pudding we ate room temperature and it just seemed that was best. Shelah confirmed that is the only way she has ever had it, yet the Slow Food in Canada Ark of Taste information does say that some people do fry it. The texture of the pudding was very much like a paté, yet the flavour was distict, like no other sausage or pate I have ever eaten, and really tasty. I believe the combination of Summer Savoury and corriander would be unique, and interestingly, neither sung out. Together, they created a novel flavor that was not identifiable as either one. Out came a second tray laden with hot sausage. Sausage must be fatty to be tasty, says me. You can see below, that this Lunenburg Sausage had a nice amount of fat to capture the flavour of the beef and pork Dave uses, and combine it with the all spice, pepper, corriander and salt. Again, a unique and unexpected, albeit simple, combination of spices. 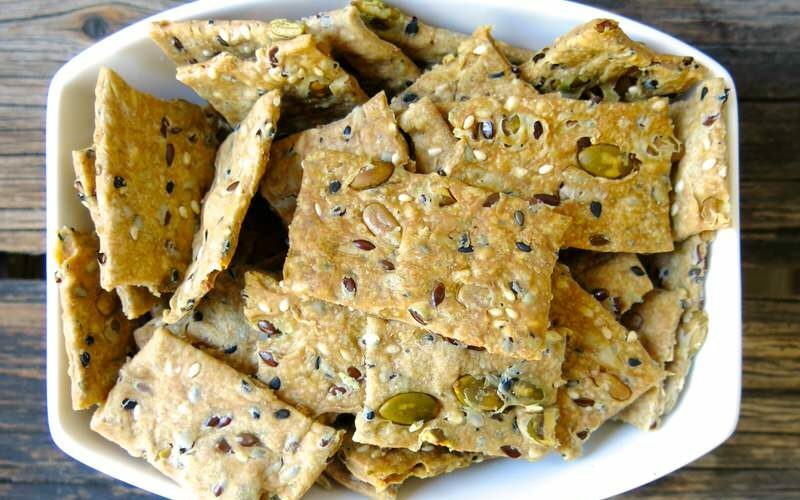 That appeared to be the secret of the success and longevity of this heritage recipe. 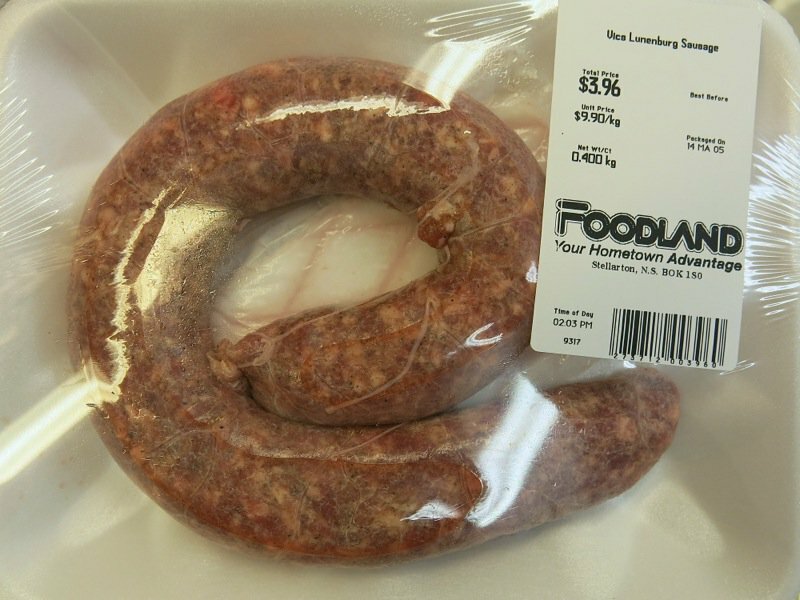 The corriander and all spice are not individually identifiable in this sausage, either. There is a distinct je ne sais quoi that is somewhat familiar, yet distinctly different than any other sausage I have eaten. Bravo, Dave! 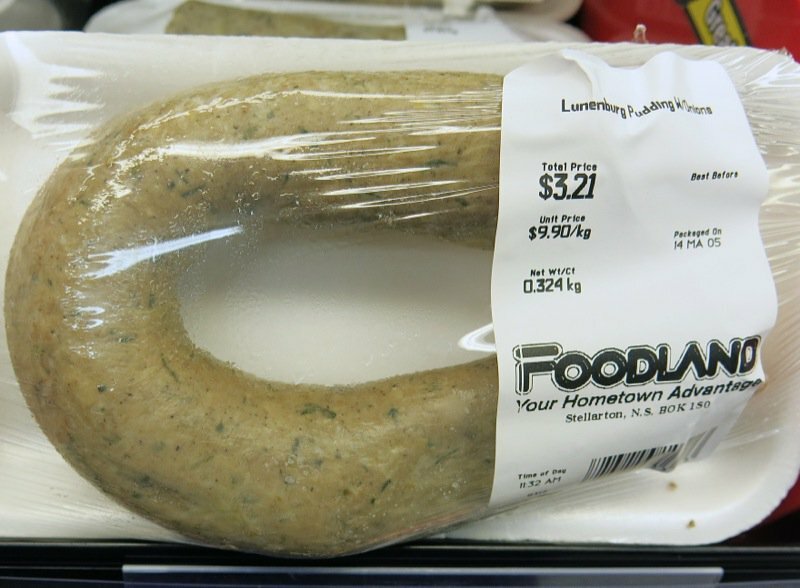 I was disappointed – as we were on our first week of three, that it would not be possible to buy this sausage to take home. This is truly the only place in the world you will find this Lunenburg Sausage and I would definitely recommend purchasing both should you be in Lunenburg for a truly regional Canadian food experience. Surprise! Solomon Gundy! I recall my dad buying and loving this as a child. 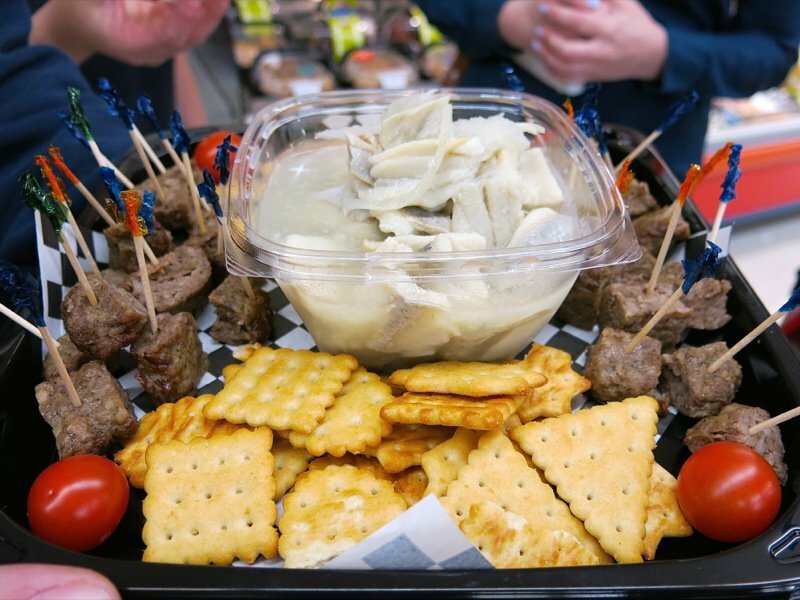 It is the local version of pickled herring and it made me sick then. However, I have since eaten raw herring in Amsterdam and fell in love with it, so dug right in. I was plunked right back into my childhood and on my father’s knee. Nope. 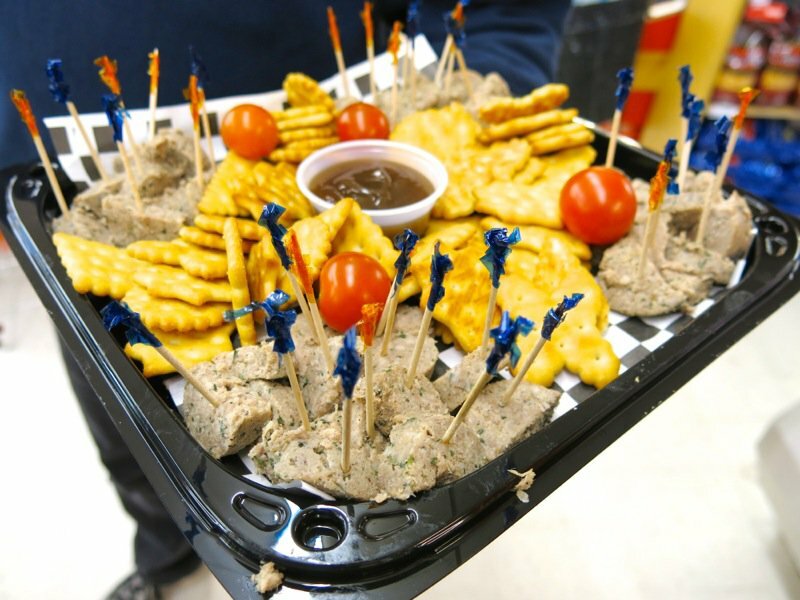 Still did not like it, but really appreciated the salty vinegary oniony preserved herring. Interestingly, I almost liked it. 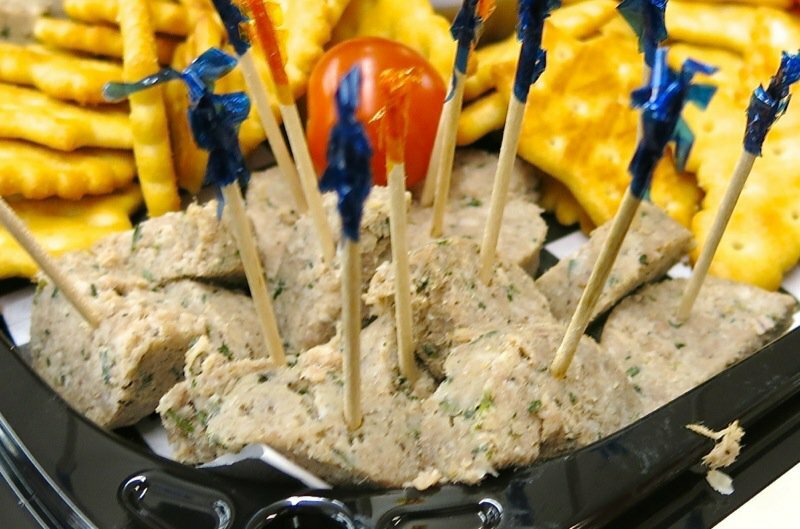 It was reminiscent of the fresh herring on the wharf of Amsterdam, yet, just pickled longer. This is definitely a flavour that is familiar to me, and I completely understood how it would remain a heritage dish through the ages in this region due to its distinct flavour. 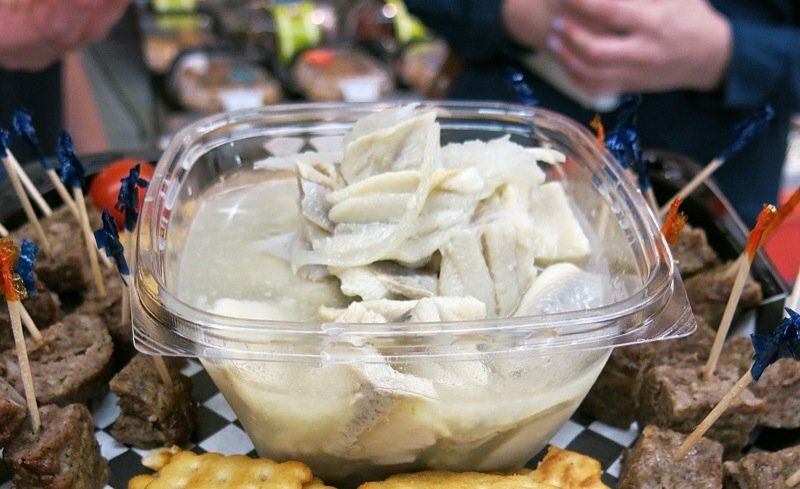 Picklng one’s own herring is coming back into the culinary habits of the region, as there is an interest into returning to one’s culinary roots throughout the country, particularly with preserving. 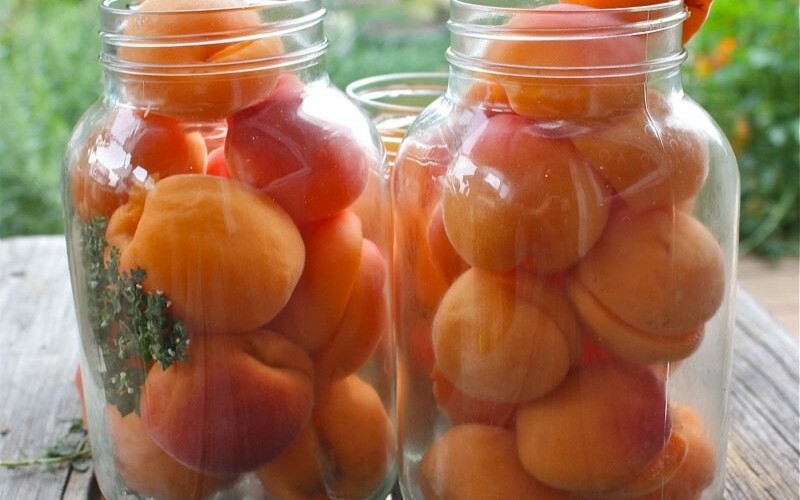 Yet, as we know for a long while, and still with most people, preserves are purchased, as above. I am sure you have gathered, by now, that Lunenburg Pudding is a pre-cooked sausage and a savoury food. The original meaning of the word “pudding” in English was “sausage”, and this heritage recipe is made from a combination of pork (“every part of the pig except the squeal”) and beef, with onions and a combination of “mixed spices” of which the herb summer savoury is prominent. It is presented in a casing two inches in diameter and has a shelf life of about ten days, though when hung in the attic through the Winter in the old days, would dry as it hung in the cold space, and last much longer. This sausage was certainly impactful, as the flavour profile, when combined with the Summer savoury and corriander, was completely unique and new to my palate. 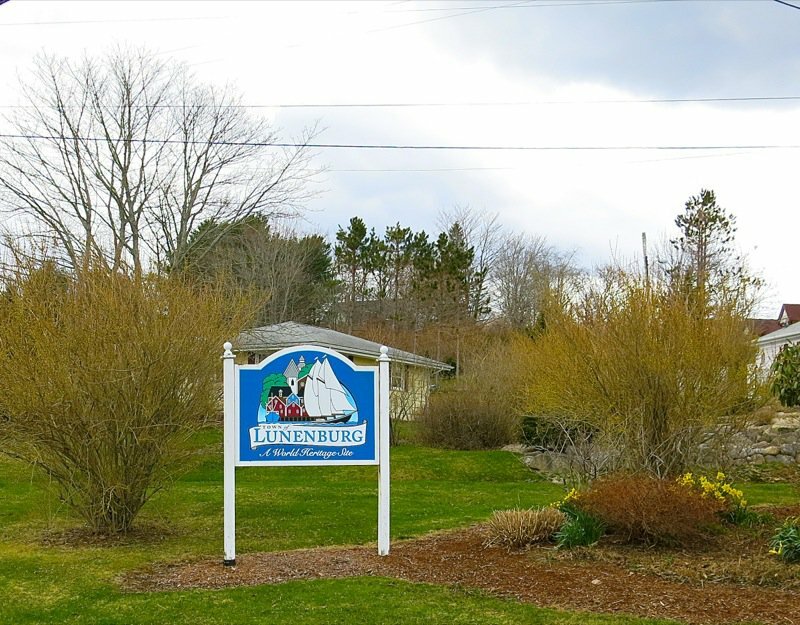 The Lunenburg community traces its roots back to Central Europe, mainly the Protestant countries of Germany, Austria, and Switzerland. The major wave of immigration to Canada happened in 1752-1753, so it is therefore most likely that the usage and recipe comes from this time period. 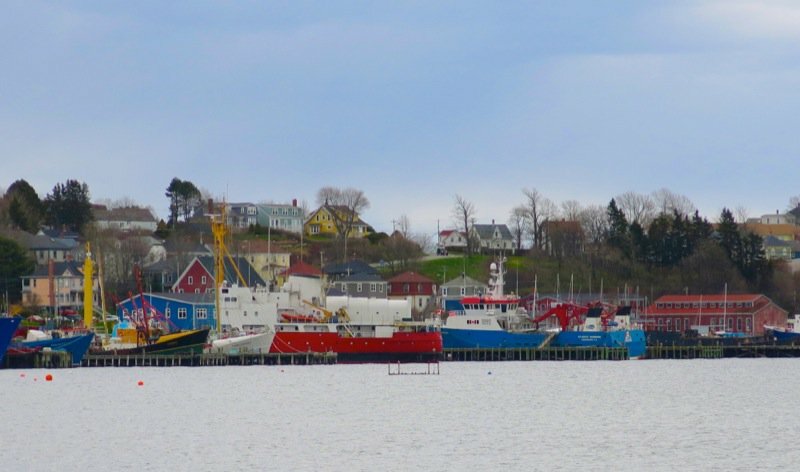 Lunenburg pudding became more commercialized as the local fishing fleets began to recognize it as a convenient supply of protein that did not have to be cooked. 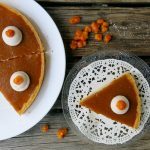 It was traditionally served as part of a meal with sauerkraut and boiled potatoes, as well as being accompanied by homemade baked beans. 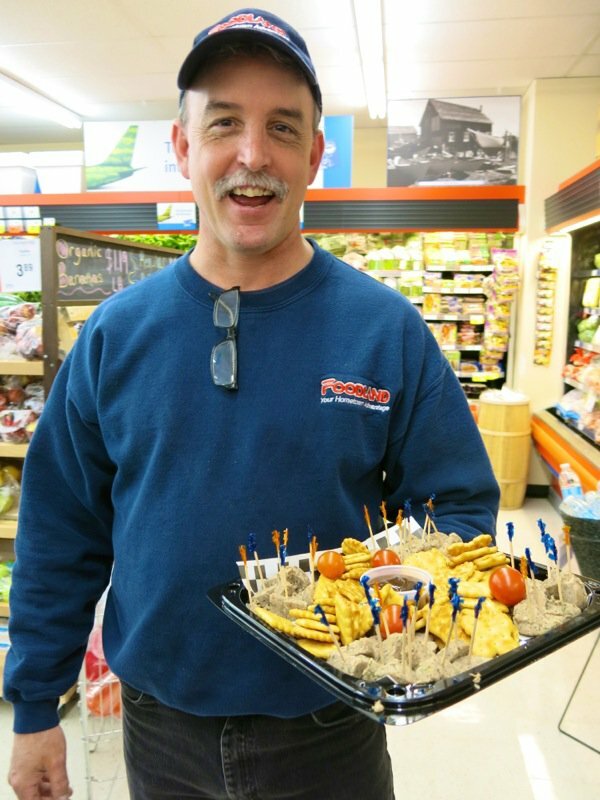 It can often be found as an hors-d’oeuvre with Solomon Gundy and various cheeses. 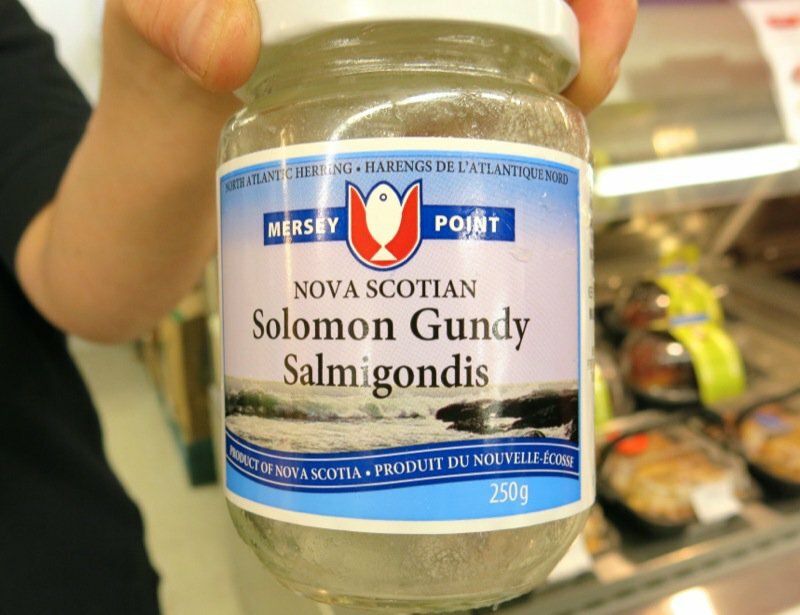 Although produced year-round, it is most popular at Christmas time, when it is purchased in volume by Nova Scotians nostalgic for a maritime taste. The principal suppliers of both of these local products are local food businesses, where the pudding is produced almost daily. Distribution remains limited, as producers operate within a Provincial inspection jurisdiction. 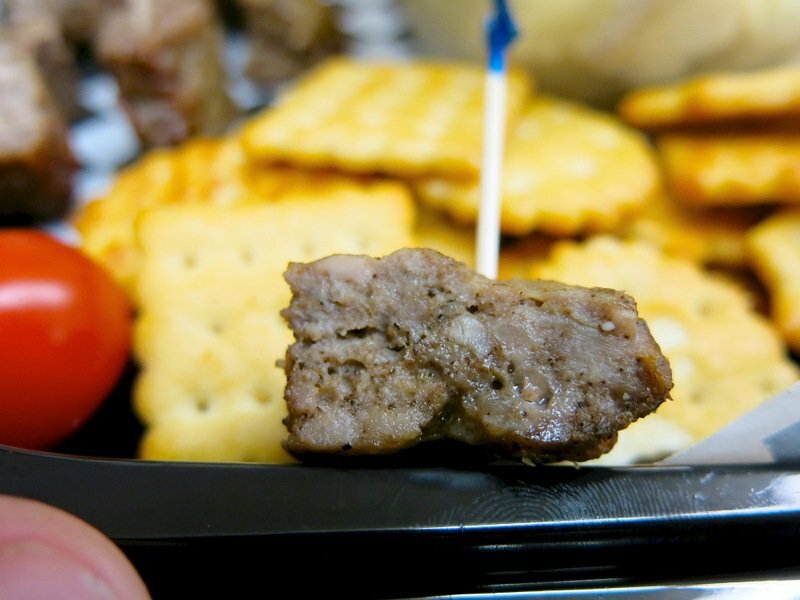 It is estimated that between 1500 and 1600 pounds of Lunenburg pudding or sausage is produced a week. 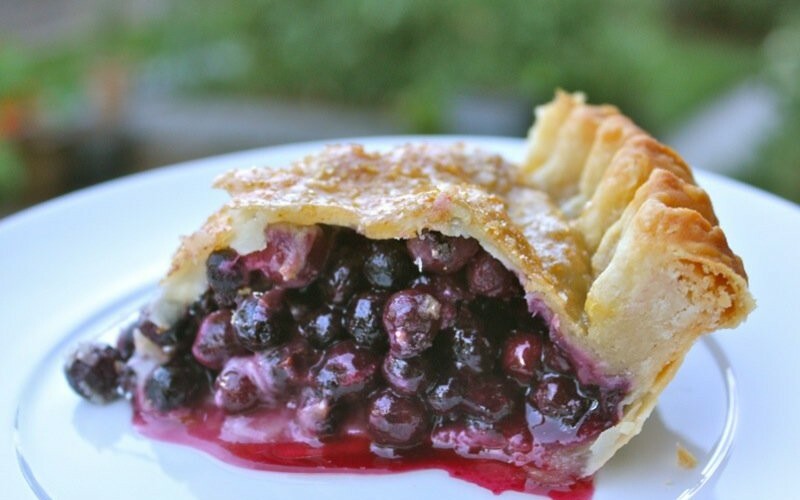 Lunenburg Pudding is not distributed nationally, and so may disappear as this generation of producers passes on, if the knowledge and recipes are not preserved. That is why the experience, and the preservation of these heritage recipes, once vital to communities like this, is profound. 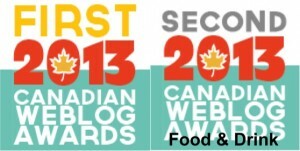 And why it is on the Slow Food in Canada Ark or Taste. Can you guess which is which? 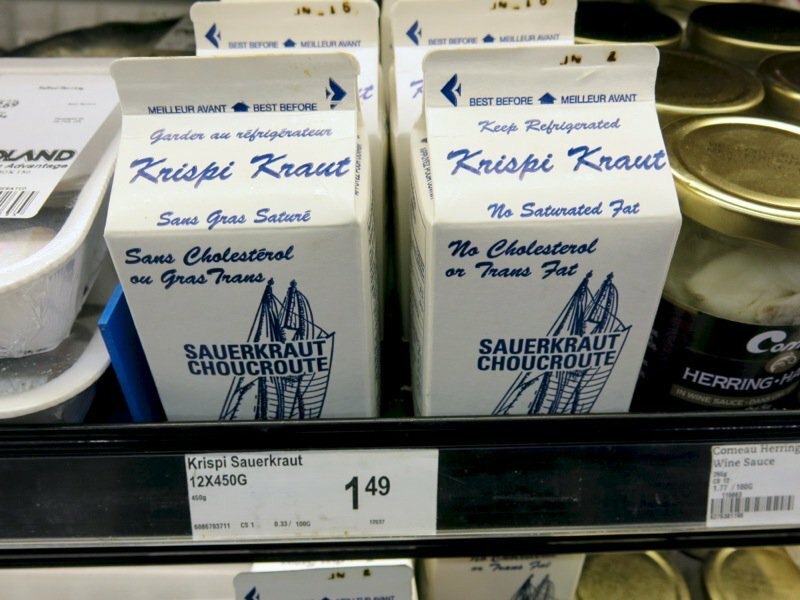 Having no local sauerkraut producers in Alberta, I wouldn’t have a clue, yet knowing the Tancook Sauerkraut is on the Ark of Taste and that the Krispi Kraut is a popular local kraut, too – I chose the darker colour as the Tancook. And, that is the Tancook. 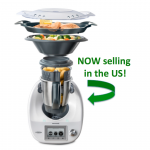 Ashlee always bought Tancook. Shelah, the Krispi. Let’s taste! 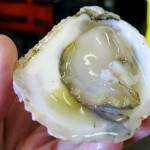 The Kristi was crisp and lively and delicious…. 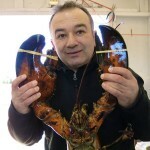 but, when compared to the Tancook, lacked complexity and depth of flavour. 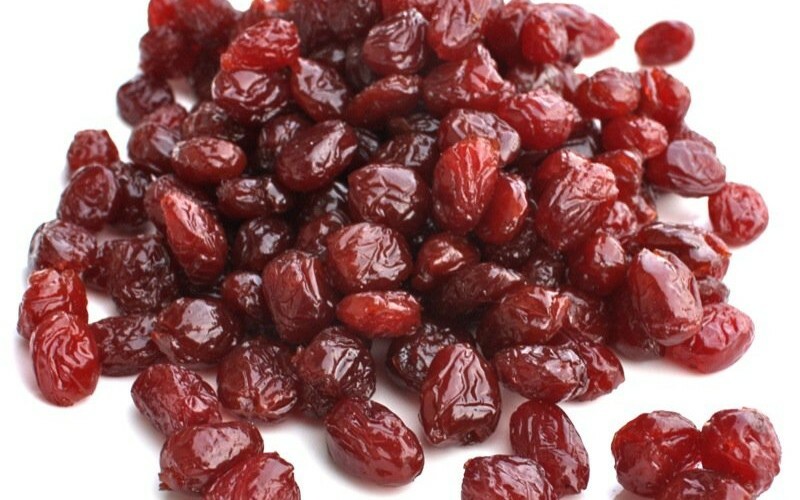 I found each delicious, but when doing a comparison, which is the value of a side by side tasting, there was no contest. All of us agreed that the Tancook was the most flavourful. Good thing, as it is also on the Ark of Taste. 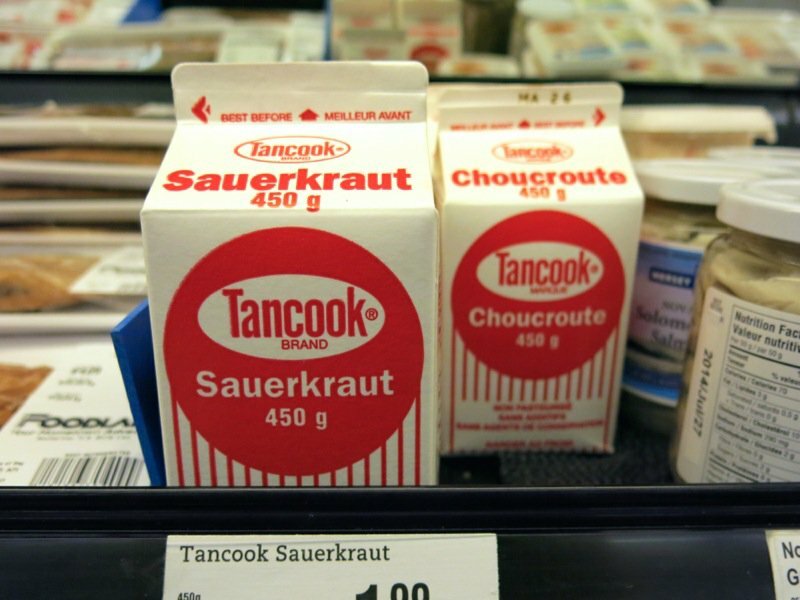 Tancook Island sauerkraut is produced from a cabbage cultivar that has been grown on this small Nova Scotia island (Tancook) for over 175 years. The smallish, tight-headed cabbage is perfect for making sauerkraut. The seeds are saved from year to year for replanting and the local cabbage fields are fertilized with seaweed harvested from the island shores. After fall harvesting the cabbage is hand shredded, salted and placed into wooden barrels with a weight on top of the sauerkraut. The barrels are covered and left to undergo a cool fermentation for up to four weeks According to producers the level of the brined sauerkraut in the barrels rises and falls with the height of the island tides. 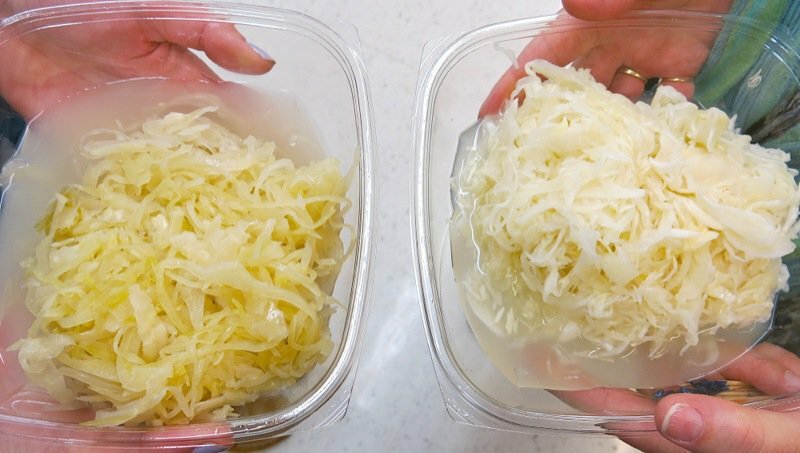 The resulting richly flavored sauerkraut has been a staple part of the local island diet and was once shipped extensively to the mainland for commercial sale. Originally produced by the German colonists on this once mainly agricultural island, Tancook Island sauerkraut production is currently dwindling. Only a few islanders, most of who are in their 80’s, still practice the art and their supply of local cabbage is under siege. Deer, a newcomer to the island, have had a population explosion and do so much damage to the yearly island crop that most islanders have given up growing Tancook Island’s unique local cabbage and many fear that this once proud local craft will be lost forever if not protected and fostered. 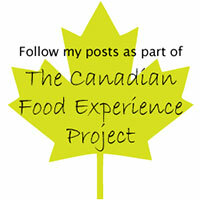 That is why it has been put onto the Canadian Slow Food Ark of Taste: to encourage its production and the transmission of its unique recipe and method to future generations. 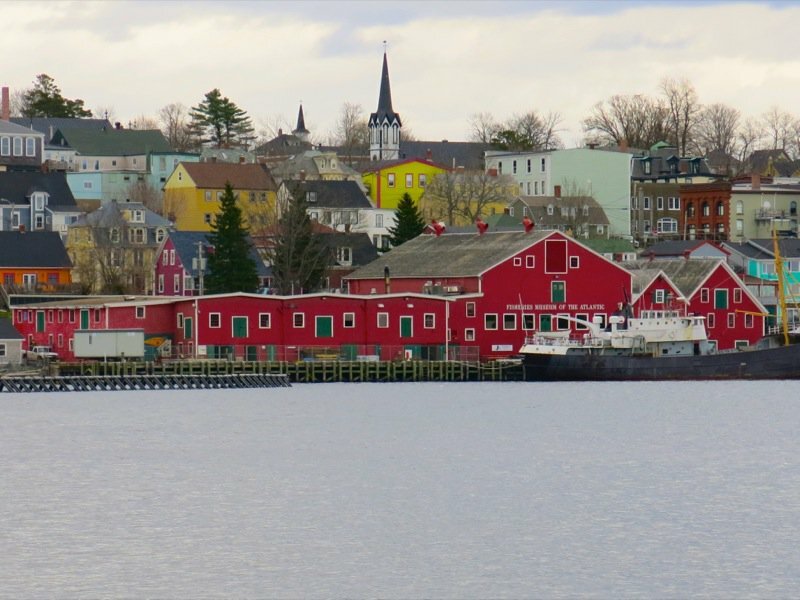 An aerial view of the town, photo from their town website, and below, images we captured across the bay. Below, Vanja with the Blue Nose…. after our tour with the gals (remember Ironworks Distillery is next, we had lunch at a lovely little place in town, that you will read about soon enough, as well. We weren’t ready to leave, just yet. 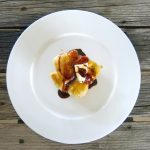 We had the rest of the itinerary for this day that Shelah had created for us, but I did manage to buy Summer Savoury and the Tancook Sauerkraut, to pack in my take home bag. NOTE: I did send this post to Shelah the day it was published, and she offered revisions which I have included. I had tried to connect with Dave before publishing the post, but was able to connect with him and included the changes he asked me to make. As a tourist, with my husband, I wasn’t wearing my journalist cap, but did take notes at lunch and wrote what I understood. Mainstream media errs all of the time, and that is their job. This is my passion. This is the first post I have written that had so many initial errors. 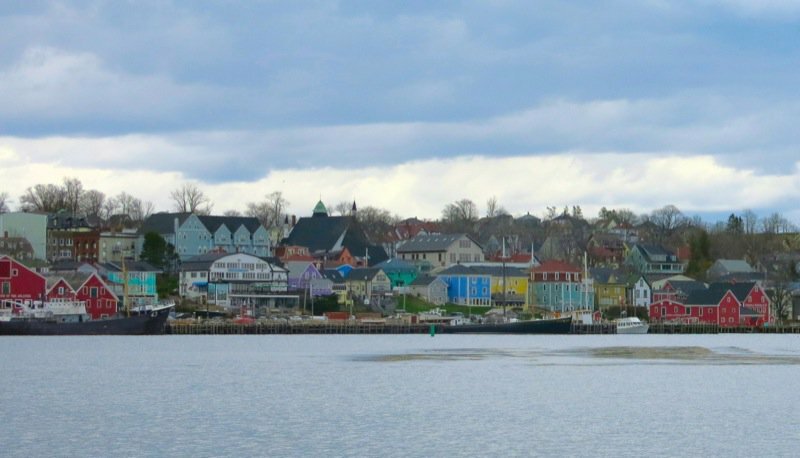 Many were minor, but I am a stickler for fact, too – and sincerely appreciate the passion for Lunenburg that both Shelah and Dave share. I believe we have the facts as they should be now. 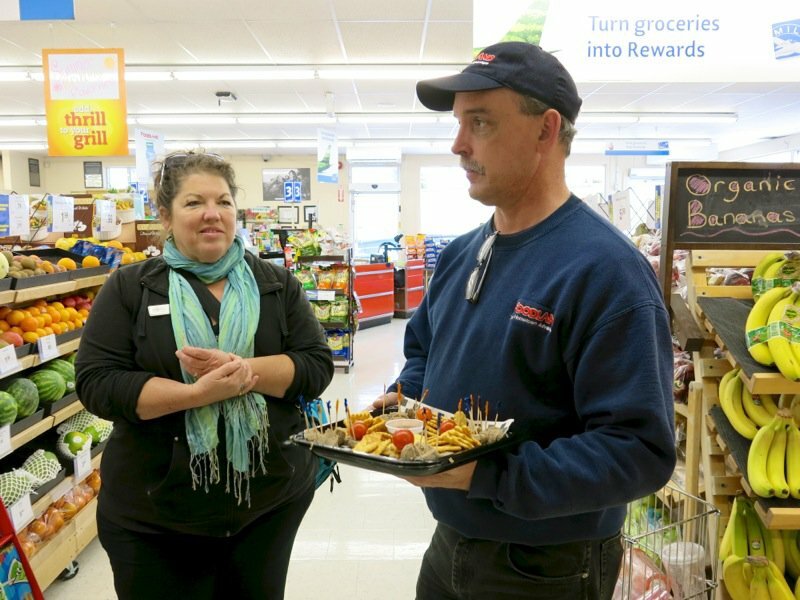 This experience was an outstanding and positive one for both my husband and I. Lunenburg townfolk, please raise your glasses to these two, and give them each a standing ovation for all of their hard work. 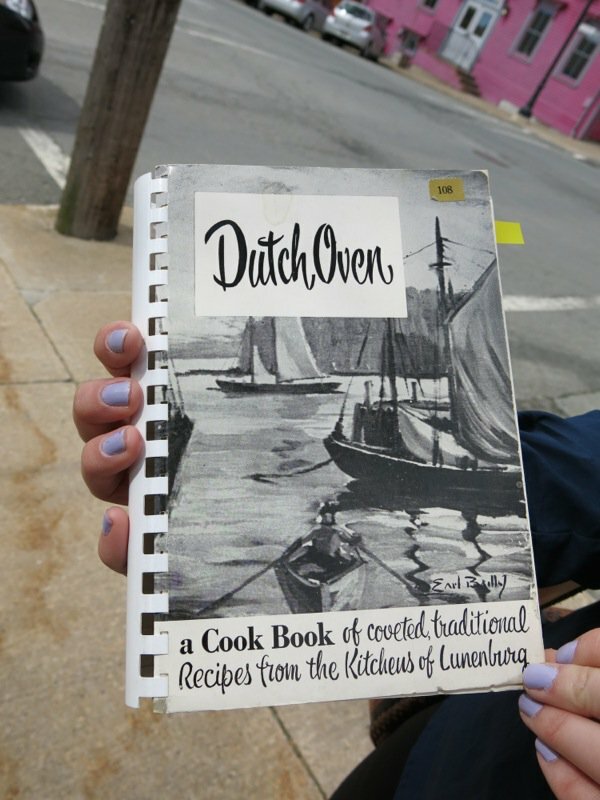 Valerie, you’ll be pleased to know there are recipes for Lunenburg Sausage & Lunenburg Pudding contributed by a James Allen in Nimbus Publishing’s “Dutch Oven”, a cookbook that began as a fundraiser for the regional hospital, and another on page 57 of “Out of Old Nova Scotia Kitchens”. AH! Forgot to add the photos of the Cookbook – I will do that now. Ashlee so kindly brought it with her and I did go to the hospital and buy a copy and saw there was a recipe there. This post is going to be a LONG one. Hope you got my e-mail about going for tea! I so loved all this Info . Wonderful to hear, Dave! Always curious about regional Canadian home food. 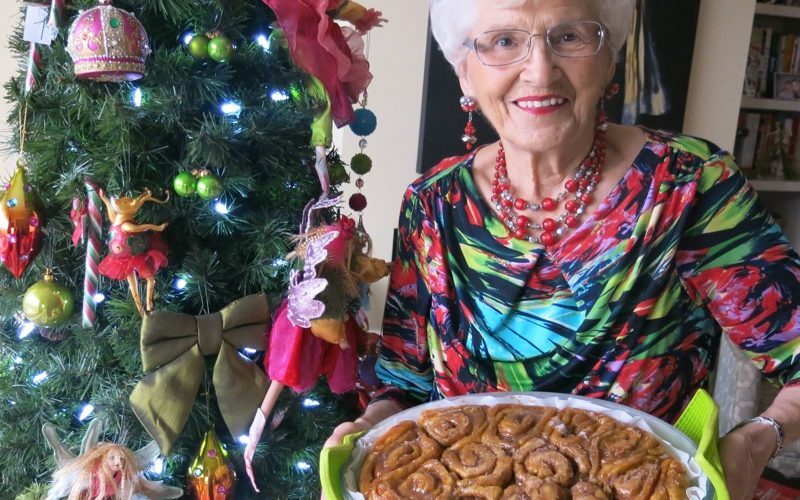 Can you share your favourites, and if you still have any recipes from your mom that you make today, or loved, I would love to have a copy… to try them out!